Thirteen years after the Wright Brothers historic first heavier than air sustained flight, and four years after Wilbur's untimely death, Orville Wright, in need of a peaceful retreat, visited Canada's Georgian Bay wilderness and purchased an Island near Honey Harbour, Ontario. Between 1916 and 1941, Orville and his sister Katherine journeyed from their home in Dayton Ohio to Penetanguishene to spend relaxing summers at his Lambert Island property. They relished the simple lifestyle and rugged beauty of the Bay, often accompanied by family members and a host of interesting visitors, including AY Jackson of Group of Seven fame. 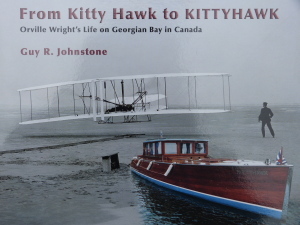 Orville's life on Lambert during those years are beautifully and thoroughly documented in "From Kitty Hawk to KITTYHAWK" by Guy Johnstone, Kittyhawk's current owner. Offered for sale well below appraised value, Guy's wish is to see Orville's iconic runabout preserved as a reminder of the Georgian Bay area's remarkably rich history and times past when design, craftsmanship, performance and elegance were the order of the day. 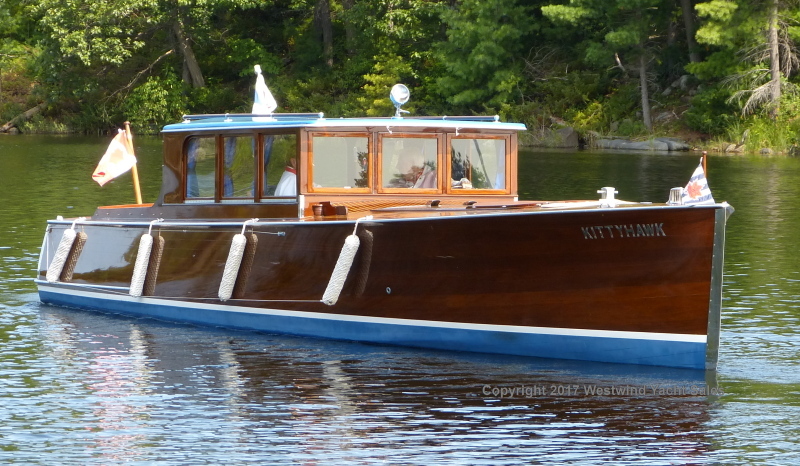 Kittyhawk was built in 1928 in Penetanguishene by the Gidley Boat Company, a renowned and respected builder of boats ranging from rowing skiffs to 110' raised-deck cruisers. Established in the 1890's, Gidley turned out sturdy boats capable of handling Georgian Bay's often unpredictable conditions. While few Gidley's remain today, those still in service are highly prized as fine examples of a bygone era of classic wooden boat building. Orville replaced his first Gidley, a 20' runabout, with the 32' Gull model in 1931. He used it personally up until his last visit to Lambert in 1941, when he was recalled to Washington as an advisor following America's entry into World War II. Upon his death in 1948, ownership of Kittyhawk and Lambert Island passed to his heirs until 1953 when she was purchased for use as a water taxi by Wilfred A. France, local operator of a tourist establishment at nearby Franceville and long-time friend of the Wrights. She was damaged in a storm in the mid 60's and sat in slings awaiting repair until purchased by Wilfred's daughter Kathy as a gift for her husband Guy in 1972. Greavette Boats of Gravenhurst was commissioned to perform a full restoration and she was re-launched in Midland with great fanfare in 1975. A second restoration was completed in 1988 by Butson Boats, and she was refinished again in 2006 by Woodwind Yachts, Nestleton, Ontario. Kittyhawk remains today in show-ready condition, ready for new custodians to add another chapter to her rich and truly impressive history.